Bill and I met up with Arthur Simoneau in the Cox Field LZ about 9;30 this morning; by 10:15 we were once again at the Dry Canyon launch site. Bill didn't like the easterly flow in the forecast, and so had volunteered to drive this day. Conditions were indeed unsettled. Wind at the ramp was either zero, or downhill, and clouds overhead were moving from the east and northeast. Nevertheless, the forecast was for southwest winds, and eventually we got some, but only after several dust devils went through launch, one of which attacked my glider, viciously and unprovoked. Bill saved the glider heroically, and banished the dust devil to the hell from which it came. Arthur was the first to launch, about 1:00 pm in his Airborne Sting, and it was interesting to watch; he flew well, got into a thermal, got out of a thermal, and plummeted like a brick. But when I spotted him thermalling out past the West Face, I decided I was ready to go. I launched well, as Arthur did, and had a rhythmic, musical flight - in other words, I flew like a piano. I hit a couple of rough thermals and gained a few feet, but mostly I was plummeting downward in the U2-160, clearing Curt's Bluff by about 100 feet and then praying that I'd find some lift and clear the power lines on Scenic Drive. God responded with some lift right then (God is much faster than most government agencies, you'll notice) and I cleared them by 50 feet or so. This was good, but left me with limited landing options - I put it down in the large cutout on Fairgrounds Drive between Cox Field and Scenic. Not bad, for a death-defying sled run. Arthur, on the other hand, had a great time, getting up to 2000 feet above launch height and flying for half an hour. He made a fine north approach to the LZ and put it down beautifully. Bill and Arthur were there to help me with tearing down, and by 3:30 we were all at the burger place, discussing the day's flying and all kinds of other hang gliding experiences. Arthur said goodbye about 4:00; he and his girlfriend have to return to Southern California by Monday. Good times all around, and I surely hope that we see him again. And THANK YOU, BILL! I wouldn't have flown without your help. Thank you, Bill, for another excellent video. I can learn from this - and, of course, relive all my mistakes, for as long as the Cloud and YouTube exist. It's too bad we didn't have the camera on for Arthur's launch - he had a really nice one. All in all, I'm glad we went out to fly. And so nice that nobody wound up in the power lines! Bill's captions had me on the edge of my seat from start to finish!! I'm glad this movie had a happy ending. I love this thread because it shows so much of what hang gliding is all about. If you had been in a paraglider you probably wouldn't have been able to make it out to that LZ but, more importantly, do you think you would have had at least one collapse in that turbulence? That day and time, at that site, were not appropriate for flying PG's. I'm pretty sure of that. 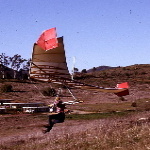 It darned near wasn't appropriate for hang gliders, either! Arthur made it happen, somehow, and my hat (helmet?) is off to him. That was one of my more white-knuckle experiences. I had a flight at Guadalupe Dunes CA, many years ago, that I know would have killed me in a PG. At less than 200' AGL I was getting loud sail inversions on my WW SST which didn't have full length battens. But having a rigid airframe kept the sail in position to pop back up as quickly as it popped down. It was while I was taking PG flight lessons, several years ago, that I realized I wouldn't be there then, had I been in a PG during that long ago flight. I turned away from PG lessons that day and as they say: "never looked back". August 11, 2017: Bill Cummings volunteered to drive for me, and the weekend is going to be wet, so off we went to Dry Canyon this morning, hoping I could catch some airtime. Winds were straight in at launch, and the skies were clear blue - westward. Eastward looked like the wrath of the gods in preparation. We waited a while with the glider still on the truck, waiting for a sign as the clouds came slowly closer from the Sacramentos to the east, and slowly got darker and darker. About a minute after I said, "OK, let's head back down - this does not look optimal," the sign came, as a rumble of thunder came to our ears. Good enough! We had already spent our waiting time in doing some ramp maintenance (among other things we put in a little water bar just above it), and on the way back down the road we picked up all the trash we could see. The heavens opened up as we left Alamogordo, and we nodded sagely and said, "Not a bad decision." There will be better days. Bill Cummings at Dry Canyon launch, looking out on a beautiful day to the west. Robin at launch, looking east. Who'd have expected an outbreak of common sense, eh? RobinHastings wrote: August 11, 2017: Bill Cummings volunteered to drive for me, and the weekend is going to be wet, so off we went to Dry Canyon this morning, hoping I could catch some airtime. Winds were straight in at launch, and the skies were clear blue - westward. Eastward looked like the wrath of the gods in preparation. We waited a while with the glider still on the truck, waiting for a sign as the clouds came slowly closer from the Sacramentos to the east, and slowly got darker and darker. About a minute after I said, "OK, let's head back down - this does not look optimal," the sign came, as a rumble of thunder came to our ears. Good enough! We had already spent our waiting time in doing some ramp maintenance (among other things we put in a little water bar just above it), and on the way back down the road we picked up all the trash we could see. The heavens opened up as we left Alamogordo, and we nodded sagely and said, "Not a bad decision." There will be better days. Once again RGSA picking up after all the other Goops!